The wall structures for the new Watford City High School, east of town are almost done, meaning the construction is finally at its halfway point. Completion is on target for the end of the year, with the transition of school students moving into their new building set for January 2016. Kraus-Anderson Construction Company of Minneaplois, Minn., has been feverishly working to stay on track with their time frame, and according to Holen, they have been a really good construction team to work with, having a good flow and working at a great pace. With the framing going up, block work being set, and masonry work being accomplished, rooms are starting to take form in the new state-of-the-art building. According to Ron Shatto, area superintendent with Kraus-Anderson Construction Company, windows and roofing should be done in less than a month. Once enclosure takes place, the process will move rather quickly. With the expansion of the cafeteria space, an additional 3,000 square feet was added to the total square footage of the building. With that additional space added, the total square footage of the entire building will be approximately 160,000 square feet, with a capacity of 800 students. According to Holen, there are contingencies built in to add in the future if needed. With 600 students enrolled in the existing Watford City High School at the end of the 2014-2015 school year, there is no denying that those students were feeling cramped in a much smaller space. The existing high school building, built in 1985, is only 120,000 square feet, with a capacity of 500 to 600 students. With that capacity fully maxed out, students are undeniably looking forward to the transition into their new high school facility in early 2016. The new high school will boast several features and upgrades including a new full-fledged theatre with an orchestra pit, a larger gym, a student grill area, a student store, updated and changed spaces for the vocational agriculture and family consumer science departments, five computer lab classrooms, several commons areas for team teaching, several teacher office/working spaces, an extensive amount of parking, and an underground walk-way to the new Events Center. Watford City High School’s existing gym, built in 1957, has outgrown its current capacity of 800 people. According to Holen, the current gym is the oldest piece in the district, but has served the community well. The grill operation in the new building will be able to double as a concession for the many sporting/educational events held in the gym, as well as a grill the students will be able to use as an extension of the classroom and for school lunches. The full-fledged theatre, complete with its own sound and lighting system, will be able to not only offer the students an enhanced learning space, but the community as well. It will open up the dynamic of the fine arts department by involving many more students and educational departments. Not only will the music department be able to use this new space to its full extent, but students from the theatre and the computer/science departments will additionally. The transition of moving high school students from the existing building into the new one is still being planned for January 2016, says Holen. Grades 7 through 12 will move up to the new building, while the fourth through sixth grades will be in the old high school building. Once the transition takes place, a crowded 725-student elementary school will then become a less-packed building with approximately 550 to 600 students in grades K-3. And there will be about 300 to 350 students in the new high school building. Of course the school district will have to duplicate services adding a third building. But because there are currently two principals at the elementary school, one will stay at the elementary school and one will move over to lead the 4-6 grades. The long-term goal, according to Holen, is to have the old high school building operate and function as a true middle school, which will most likely serve a middle-level range of students from grades 6-8. And according to Holen, once the fourth and fifth graders move to the old high school building, those students will still have time to stretch their legs with recess. It might just look different than it used to at the elementary school. Holen says they will have to get creative with some spacing, as there will be limited green space with the old high school building. 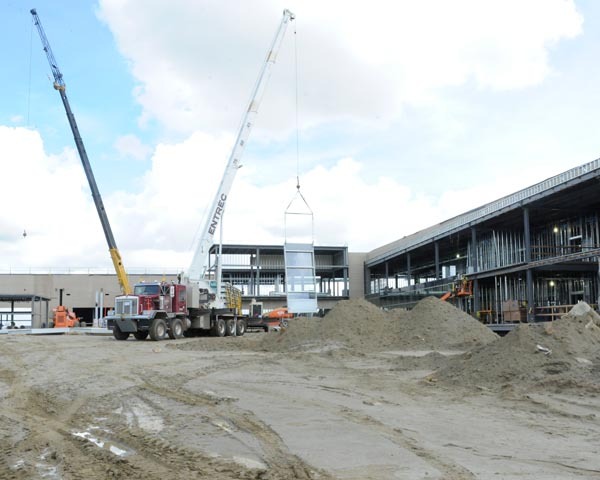 As construction on the new high school nears the end, and transition moves its way closer and closer, Holen imagines there will be a series of open houses to allow students, parents, and community members to see the final outcome of a $53 million project. To keep updated on the current progress and/or to see pictures, visit the school’s website at www.watford-city.k12.nd.us and click on the new high school project tab.